Screenshot of the whole Resize tool in RawTherapee 5.4-789-ga7b7f20b8. 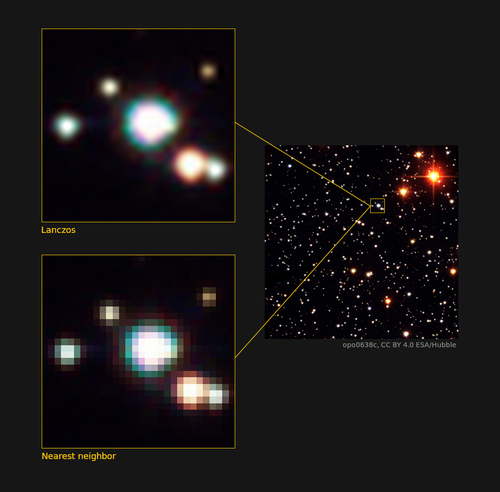 Demonstration of the effects of the resizing methods "nearest neighbor" vs "Lanczos". Resizing is one of the last things to happen when saving an image - this tool runs after most other tools and transformations. As downscaling an image involves a certain loss of detail, this tool includes a "Post-Resize Sharpening" component which you can use to make the downscaled image crisp. The effects of the Resize tool will not be shown in the preview. The saved image will of course be resized. The downscaling limit is 32x32px. The upscaling limit is 16-times the image's size as of RawTherapee version 5.5. In versions prior to and including 5.4, it was 4-times the image's size. The "nearest neighbor" method of interpolation is meant to be used when you want to upscale an image in order to make some detail larger without introducing smooth blending between pixels. It preserves the pixels as they are. It is usually used when upscaling by squares of 2: 2x, 4x, 8x, 16x, etc.. The result will be very sharp, but also very blocky. This method is not meant to be used for everyday photography. Lanczos is the default method. It is meant to be used for everyday photography and in all cases except for the one described above. It results in a smooth yet sharp and high quality image. Use it to resize by any amount. Use this if you want to resize the image by a specific amount. or it make it 4x larger, set scale to 4. Use this to specify the desired width in pixels, and have the height adapt while keeping proportions. Use this if you want the image to fit inside a certain width and height. e.g. if you want the longest dimension of your image to be 1000px regardless whether the image is landscape or portrait, set a bounding box of 1000x1000px. e.g. if your image has dimensions 3000x2000 and you want it to fit on a 1080p/Full HD screen, set the bounding box to 1920x1080 and your image will be resized proportionally in such a way that the width will not exceed 1920 and the height will not exceed 1080. You will typically want the width and height to apply to the cropped area, however you can also have it apply to the full image, though even then of course only the cropped area gets saved. This setting controls whether the resize tool will also upscale your images, or only downscale. If it is disabled and the combination of image dimensions, crop dimensions and resize dimensions is such that the image would need to be upscaled to meet your target, this setting will prevent it from being upscaled - it will remain at its current size. This setting was introduced in RawTherapee 5.5. If in RawTherapee 5.5 you use a sidecar file from an older version of RawTherapee, this setting will automatically be disabled. Resizing an image often leads to a loss of sharpness, so it is common practice to sharpen the image again after having resized it. With the Post-Resize Sharpening tool you can save crystal-clear images straight away with no further hassle. Because this tool works on the image after it is resized, you cannot use the preview to see what it will do, though this is not a problem because the procedure for finding the right values is straightforward. Tweak your image as you usually would and enable the Resize tool, e.g. downscale using the Lanczos method to a 900x900px bounding box. Save the image to a lossless format such as TIFF. Open that saved TIFF in RawTherapee, apply the Neutral processing profile if that wasn't done automatically, and enable the Sharpening tool in the Detail tab. Zoom to 100% (1:1) and tweak the Sharpening tool's parameters until you get a result that satisfies you. These are the values you should use in the Post-Resize Sharpening tool. Go back to the raw image, enable the Post-Resize Sharpening tool and set it up with the values from the previous step. 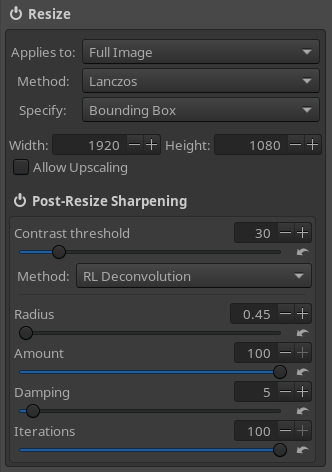 The Post-Resize Sharpening tool is only available when you use the "Lanczos" resizing method. As the Post-Resize Sharpening tool works identically to the standard Sharpening tool (except that it takes place right at the end of processing), refer to the Sharpening article to learn more about how the sharpening tools work. This page was last edited on 30 October 2018, at 20:22.